Have you ever considered using video as a tool to help you grow your business? Think of how much time you spend every day watching TV, movies and other video-based content. Now imagine being able to reach your target audience that way. Making videos doesn’t have to mean lots of expensive equipment and endless hours of editing. With the availability of so many free and inexpensive options, even the most novice of budding filmmakers can put out a great product that could be just the punch your marketing needs to entertain and inspire your audience. Caleb Wojcik teaches video web production and has been making videos for nearly a decade, spanning everything from professional sports, commercials and even training videos. He has graciously shared some effective tips – including equipment and software recommendations – that will help you to make great videos regardless of your budget or skill level. 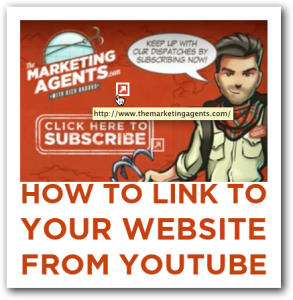 Have you ever wanted to link to your website directly from within a YouTube video? Then this post is for you. I’ve recently starting using YouTube as part of my online marketing campaigns. I know I can ask viewers to visit my website as part of the narrative, or create a link to my website (or landing page) in the description, but is there anyway to create a link from within the video? If I had gotten this email a few months ago I would have said yes, but you’ll need to jump through a bunch of hoops and create overlay ads for your videos, something that can add quite a bit of time to your video marketing. If I had gotten this email a few weeks ago I would have said yes, but you’ll need to use some 3rd party software.